How zoning distorts the demand for housing at Pacific Standard magazine. Subject Article: "Low-Rent Mansion Living? In Vancouver? Really?" The three-bedroom condominium Krishna KC owns on the 21st floor of 126 Simcoe St. was ostensibly built for a family. When developers tried to build the tower, they agreed to make 10 per cent of units from floors 19 and above three-bedroom ones, a condition applied by the city in order to create new dwellings for families. Mr. KC, a property investor, bought the unit preconstruction and rents it out – but not to whom the city had in mind. His current tenants are a trio of roommates in their early 20s with jobs in marketing and sales. They’ve turned the condo into a bachelor pad: there are two flat-screen televisions, an Alexander Keith’s chalkboard – the kind pubs use to advertise drink specials – is set up in the kitchen and bottles of gin, vodka and Gatorade are stored on every available surface. I'm tempted to deviate from my game plan and discuss how supply, in this case, was supposed to induce demand. The intended demand would put, perhaps, two incomes in a space that now supports three incomes. Furthermore, the dual income house (if both parents do, indeed, work) is burdened with dependent costs (e.g. child care) that chip away at the money available for mortgage or rent payments. Conventional metrics such as average income and population don't capture the differences in demand for the same urban space. There exists much error (and hot air) in our models of real estate markets. Housing affordability and overstating geographic abstractions at Pacific Standard magazine. Subject Article: "Take A Look At Very Specific Cost Of Living Maps For Texas." Other Links: 1. "The Midwest is outpacing the South in creating manufacturing jobs." 2. "Is Life Better in America's Red States?" 3. "Brooklyn And Park Slope Are Getting Less Alike, Not More." 4. 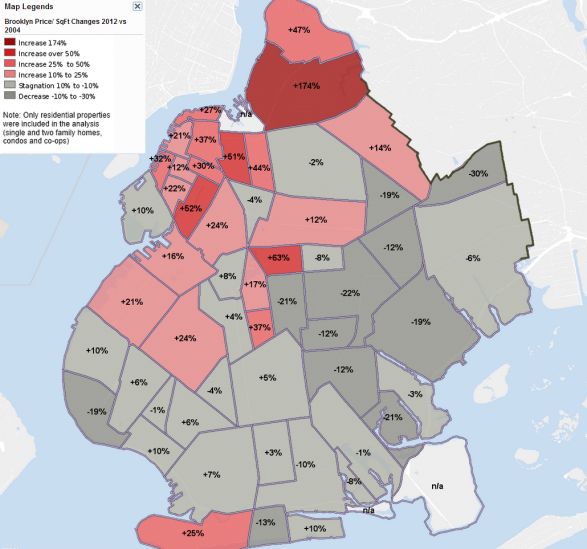 "Map: Brooklyn residential price per square foot from 2004-2012." Postscript: In a world where metro regions are the economic geography of choice, I wouldn't pay attention to conclusions drawn using a US state as the geographic unit of analysis. Bad enough treating a metro as a real estate market monolith. We are just beginning to grasp the real estate premiums associated with access to public transportation. More supply elsewhere in the region won't magically reduce prices for housing in areas with good access to transit. Yet the analysis of the effect of land use regulations is at the scale of metro. In such a light, one can't be so sure that Toronto is a good example of "a city where NIMBYism is kept in check." The debate about housing affordability remains ideological. How do we evaluate the efforts of economic development professionals? Subject Article: "Some dispute claims of widespread job growth in Valley." Other Links: 1. "International Economic Development Council: How to Become Certified." 2. "The Graduate 'One Word: Plastics.'" 3. "Brent oil falls below $53 for first time in over five years." Postscript: I'm setting the stage for some subsequent digging into the world of university-driven economic development.